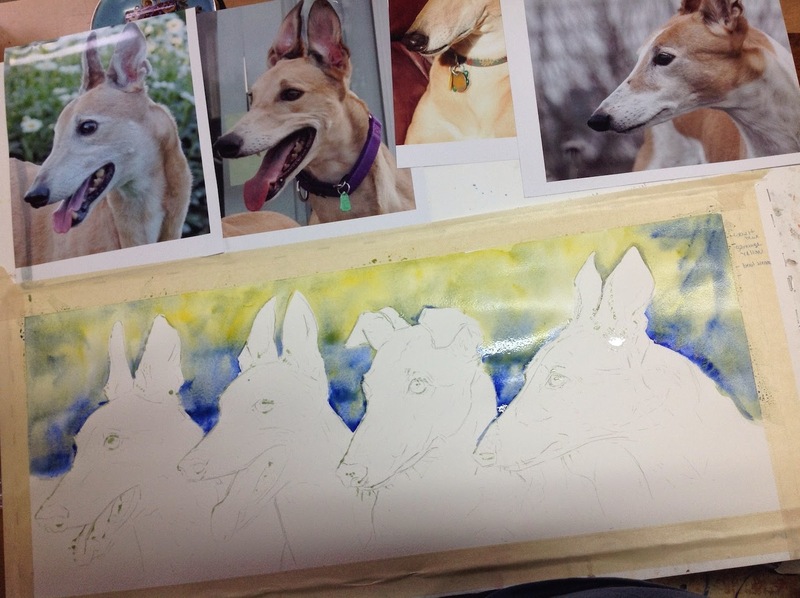 I always take photos as I progress with a painting, thought you might be interested in seeing the progress of this one, this greyhound portrait is approximately 11 inches tall 25 inches across. 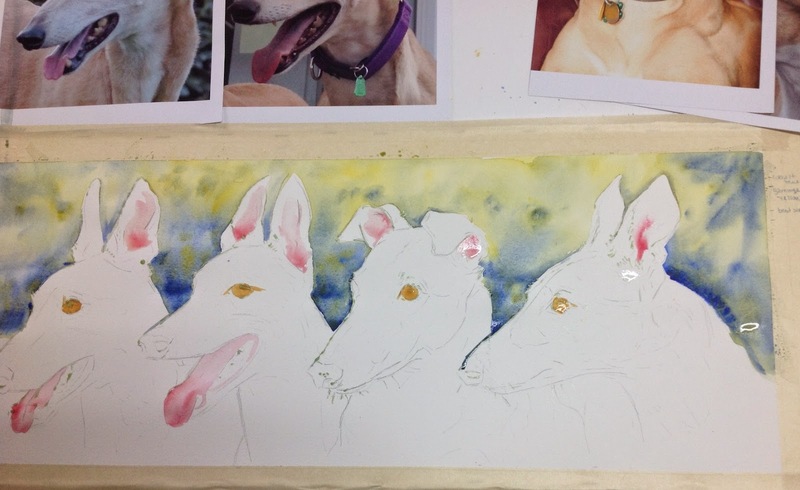 The most challenging part here was working from different photos to combine into one painting and getting the proportions, colors, lighting right among the four dogs. I begin with the sketches, and then transfer them to the watercolor paper. 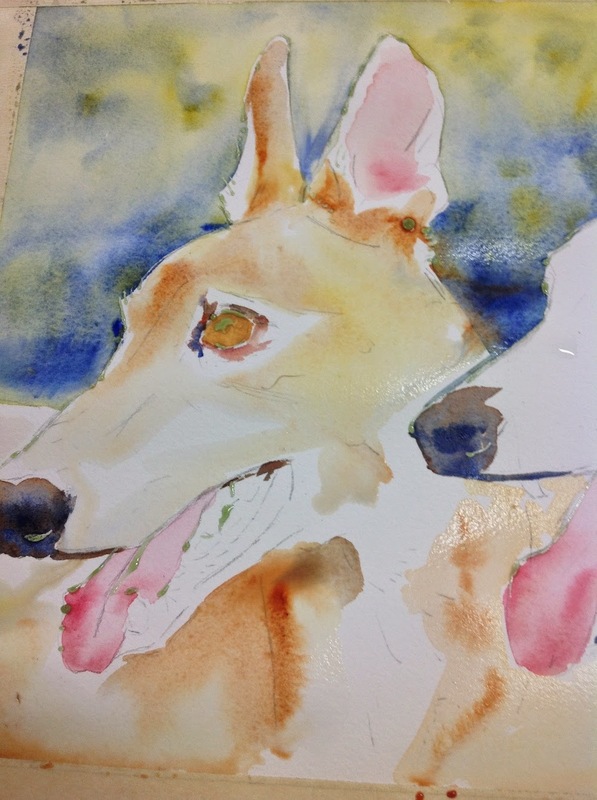 This paper is 140# Arches cold press watercolor paper. I have masqued off some of the sharper edges to create a clean line. 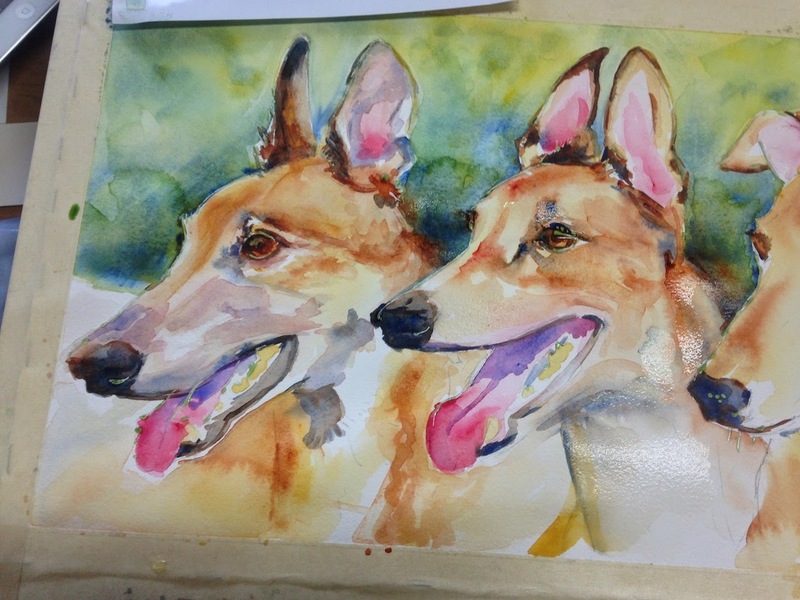 Start by adding some loose background color behind the dogs. Here I continue to loosely add in color and shapes, the washes are very dilute and this part goes quickly. I am really just roughing in shapes that jump out at me. I continue dropping in loose washes. Looking to create shapes, lighter areas and darker areas. I have to think about where the light is coming from and where cool and warm colors might fall. This is so much harder with multiple photos where the light source is NOT consistent! I try to stand back often and look at the whole painting, I prop it up in the kitchen and stare a lot to see where I need to go with it. Right about now I wish I had these dogs in the studio with me, so I could know who was darker and lighter, bigger and smaller! I want them to look correct! 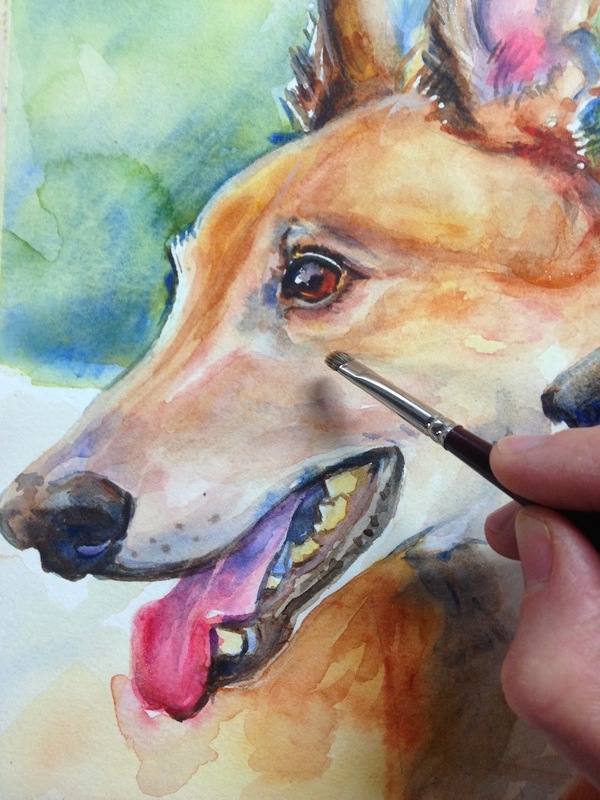 A key for me in painting dogs, is to come back with an oil brush and smooth the layers of paint a bit, to eliminate some of the rough edges. I want the coat to look as though it lays correctly. It is almost like brushing the dog with your paintbrush, in the direction the hair lies. I have to stand back often to see what looks right and what needs changed. 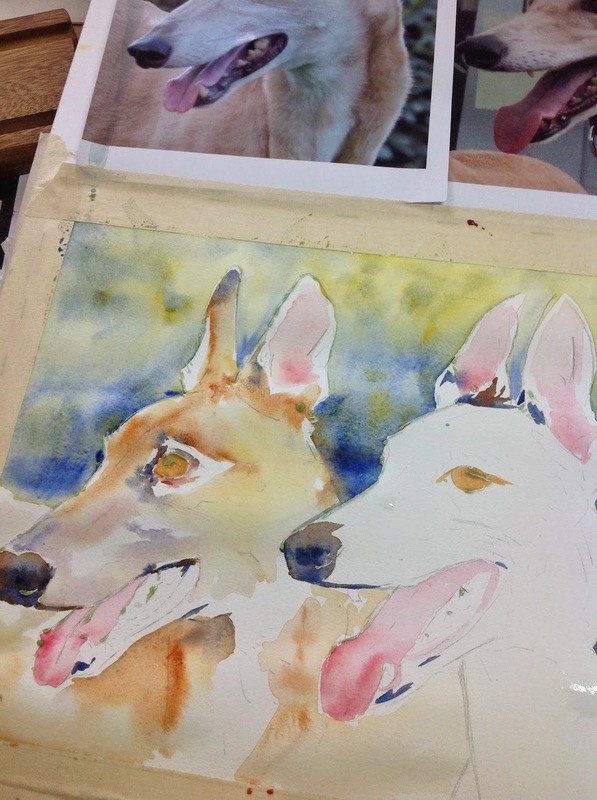 Will build up and soften the washes of the background as I go. The details I have to do slowly, this takes so long, polishing up the eyes, the ears. These are the most important parts to the owner, and what will make the dog look like THEIR dog and not just A dog. And it's not fair, they get to see their dog every day, and know them so well! 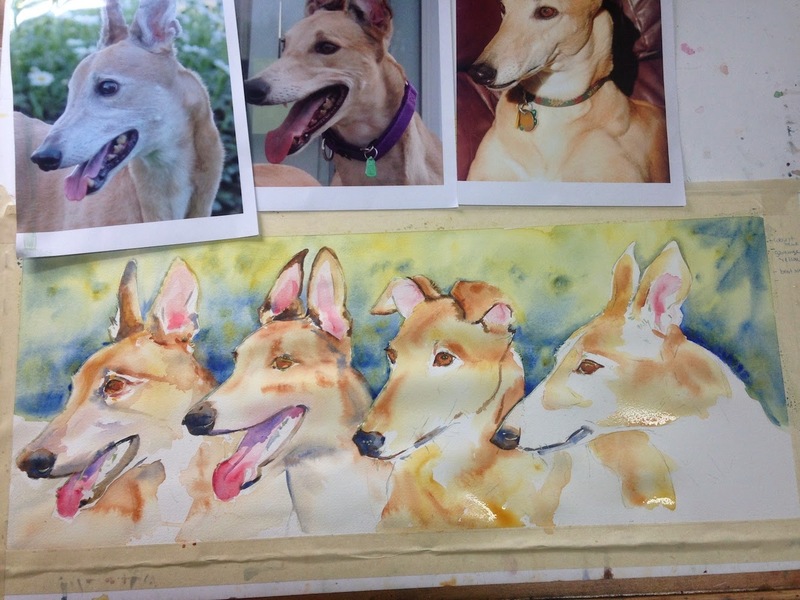 I only get a few photos to figure it out :) This was the finished painting, and the owner was very pleased with it. And therefore, I was too :) Any questions? Feel free to ask me. 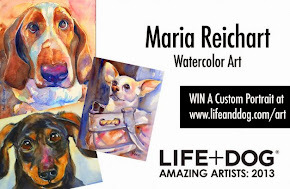 Marvelous paintings! Such handsome dogs!